Can I Play Lottomatica Lotto Online? Read Reviews! 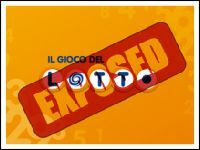 Lottomatica Lotto Exposed — Italy’s Fantastic Wheels of Fortune! Do you love playing European lotteries every now and then? If so, you’re probably familiar with Italy’s SuperEnalotto – one of the most prominent opportunities to win big cash. This review, however, isn’t about SuperEnalotto. In fact, it will present another traditional Italian lottery that you may be unaware of. We’re talking about Lottomatica Lotto. The history of Lottomatica Lotto, and its current unusual format goes back to 1939. In fact, Italy has had lotteries long before that. There are some reports of lottery-like activities taking place in Milan as far back as 1448. The first efforts to establish a game that could be considered the predecessor of today’s Lotto occurred in Florence back in 1528. The game was inspired by an old electoral system used in Italy. In that system, five names of deserving citizens were drawn. These individuals were given the right to become members of the Greater Council of the Republic. Today, the game is governed by a national law that was put into effect in August 1982. A presidential decree from 1996 also ensures the fairness of the game and governs the manner in which funds collected through ticket sales are to be allocated. Is Lottomatica Lotto a Scam? With such a long, long history, Lotto can’t be called a scam. It happens to be one of the most beloved and popular games in Italy. You can rest assured that the purchase of a Lottomatica Lotto ticket isn’t going to jeopardize you and your finances in any way. As the name suggests, Lotto is operated by Lottomatica – an organization that is a member of the International Game Technology (IGT) group. The group operates lotteries in over 100 countries across the globe. Lottomatica was set up in 1990. It is an exclusive concessionaire for various lottery games across Italy and the organization is also a sales representative for sports betting and online gaming opportunities. Here’s where things get interesting because the Lottomatica Lotto format and the premise is quite different from other standard national games out there. Typically, a player selects five numbers in the range from 1 to 90. Depending on preferences, a bigger bet can be submitted. A player can pick up to 10 numbers in total. Matching at least one for the respective drawing will be sufficient to win a prize. There are three drawings per week, each one taking place at 8pm on Tuesday, Thursday and Saturday. There are 11 wheels from which numbers are drawn. Each of the wheels is named after an Italian city apart from the final one. The eleventh wheel is the national one. For every wheel, five numbers in the range from 1 to 90 are drawn. A player can decide to bet on a number, on a wheel or on multiple wheels. Because of these unusual formats, Lottomatica Lotto can produce a wide array of prizes. A player can win by matching one number regardless of the order, by matching a number and the order that it has been drawn in, by matching, two, three, four or five numbers. So, both the numbers included in the bet and the correct guesses will be determining for the amount of the prize. If a person plays one number on one wheel by betting one euro and guesses that one number, for example, they will win 11.23 euro. Obviously, the biggest prize will be handed to those who guess 5 numbers correct. Submitting a ticket featuring five numbers and guessing all of them will result in an award of 6 million euro. The odds of this happening are 1 in 43,949,268. The biggest jackpot in the history of Lottomatica Lotto was drawn in January 2014. A person from Villa Agnedo won 3.124 million euro by guessing five numbers. The second biggest jackpot in the history of the game was 3.069 million euro and it fell in January 2007. The biggest amount won by a person who guessed four numbers was 2.4 million euro (the award was handed in June 2008) and the second biggest one was two million euro. The player had bet 10 euro on four numbers for the Rome wheel and 190 euro on three numbers. The overall odds of winning any prize in Lottomatica Lotto are 1 in 18, which is pretty favorable taking in consideration the huge numerical pool. The prizes in Lottomatica Lotto are paid out after the state deducts a six percent tax. The tax applies to both Italian and international players who give the game a try. Players have 90 days from the date of the drawing to make a prize claim, regardless of the amount that they’ve won. Prizes of up to 531.9 euro can be cashed out at any authorized retail venue throughout Italy. Prizes in the range from 532 to 1.063.82 euro can be requested via a wire transfer and the sum will be deposited directly into the lucky winner’s bank account. Jackpots and larger prizes of over 10,500 euro can be claimed at an office of Banka Intesa SpA or at Lottomatica’s office in Rome. Players can once again choose to have the entire amount deposited in their bank account. Usually, such payment requests will be processed within a two-week period. Can You Play Lottomatica Lotto Online? The good news is that even international players can test their Lottomatica Lotto luck. The game is available internationally through online lottery agents. All that you have to do is pick your numbers and a representative for the respective agency will make the purchase for you. Would you mind rating Lottomatica Lotto? Regardless of these shortcomings, Lottomatica Lotto still seems like a lot of fun. It offers flexibility that few other lotteries out there are characterized by. You are in control of the numbers that you submit and the bet that you make. With all of this freedom, you should definitely check out what Lottomatica Lotto is all about. How Much Does It Cost to Play Lottomatica Lotto Online? First of all, my favorite thing about this lottery is the name. “Lottomatica Lotto” just rolls out of your tongue so nicely. Secondly I will always love lotteries that make it available for people to play online. It shows they’re innovative and in with the times.